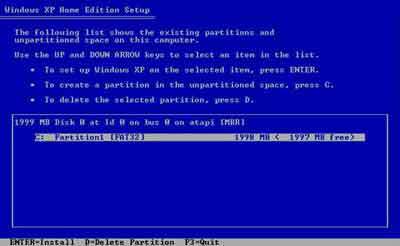 This tutorial is the 1st of a 4-part series on how to install XP on an unused PC or new hard disk. I strongly recommend you install a new instance rather than upgrade from a previous Operating System. This removes the risk of older device drivers and registry keys impacting the stability of your new install. Even though most new PC's come with Microsoft Windows 8 pre-installed, there is still lots of home computer users that want to continue with Windows XP. If you are one, this tutorial is for you! This part of the tutorial looks at some of the pre-requisite tasks you need to complete before installing the Operating System. 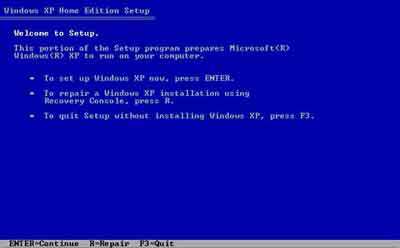 Windows XP has gone End of Life (EOL) on April 8th 2014. This means no further security patches or updates for this Operating System! Microsoft recently announced the continuation of advisories for newly discovered vulnerabilities, and the continuation of updates for things like Windows Defender only. My advice is to move to Windows 7 (assuming you wish to stay on a Windows platform) ASAP. I also advise not moving to Windows 8 or Windows 8.1. At the time of writing it appears this Operating System is experiencing numerous issues. Windows 10 is to be released on the 29th July 2015. After moving to Windows 7 it is worth waiting to see what Windows 10 brings before deciding to move to this latest version. Part 2 and part 3 talk you through the choices you have through the installation process, such as selecting your Region and Input Languages. Part 4 talks you through the final steps of the install process and suggests some post-implementation tasks before installing your applications. Each tutorial includes Hints And Tips for your consideration, based on my personal experiences as a technical support officer. Keep and eye out for them. Each step in the process is supported by an image to help you on your way. Give it a go and surprise yourself! The how To Install XP Table of Contents enables you to jump to the part of the installation process that interests you, or you are having trouble with. Why do you continue using Windows XP? What do you like about it? Why don't you upgrade to Microsoft Windows 7, or even Windows 8? Share your thoughts and opinions - Write your own web page by completing the Why Windows XP? Form at the bottom of this page. Click here to Read Site Visitors Thoughts And Feelings on why they still use Windows XP. Before we begin a new install of Windows XP, we need to ensure we have the correct tools and complete the recommended pre-requisite tasks. This checklist will save you pain later on. Try not to skip it! Download the latest version of all your device drivers, e.g. Sound Card drivers, Wireless Network drivers, Video drivers, etc. Modern computers will have no issues. Older computers must meet the Windows XP System Requirements (Opens New Window). Backup Everything You Need To Keep! A comprehensive pre-installation checklist can be found at here (Opens New Window). Next we take our first steps of the installation process - loading the text based interface and accepting the Microsoft License (EULA) Agreement. Put your original Windows XP install CD into your CD/DVD Drive and restart your computer. The following screen should appear on reboot. Press the Return Key or Any Other Key On Your Keyboard to start the install process. If this does not happen, you need to change your computers BIOS settings to boot from CD. Press the F8 key on your keyboard to agree with the Windows XP License Agreement. The EULA goes into some detail with quite complicated language, some of which you should be aware of as a home computer user. Most people ignore the detail and never know what it says. If your Microsoft Windows CD is marked Not For Resale, you are not permitted to sell the CD! Microsoft is not responsible for what happens on your computer - viruses, error messages, etc. 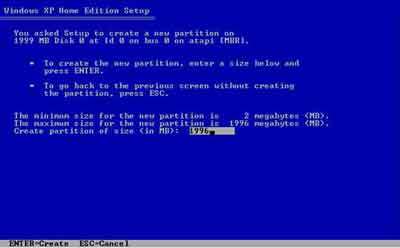 The next step is to show you the options for creating and formatting disk partitions. 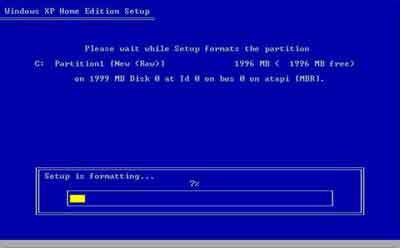 The tutorial continues with demonstrating the options for creating and formatting partitions. Most home computer users simply press Enter to install the operating system onto the C:\ Drive. 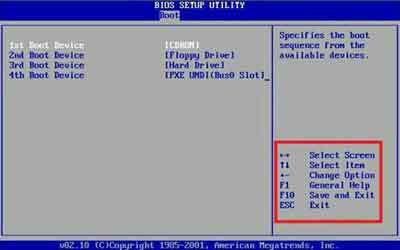 Home computer users do not need to delete and recreate partitions. Doing so greatly increases the installation time. However, if you have a new hard drive, or have another requirement to delete and create a new partition, read on. 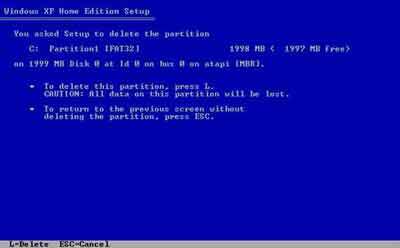 Press D to delete the selected partition. A warning screen appears with information on the consequences with proceeding. Press Enter to continue. Press L to delete the selected partition. This is your last chance to back out. Only continue if you are absolutely sure. You will see a large Unpartitioned Space on the next screen. Select this using your UP and DOWN arrow keyboard keys, then press C to create a new partition. Next enter the size of the partition you want to create. The most common choice is the enter the maximum size suggested on the screen. Press Enter to continue. Ensure you highlight the C: Partition [New ] partition, and press Enter to proceed with the partition setup. On the next screen, I recommend selecting the Format The Partition Using The NTFS File System option. NTFS stands for New Technology File System NTFS is more secure that the FAT file system (FAT stands for File Allocation Table). It also works with larger hard disks, so it is practically a pre-requisite choice these days. Press Enter to continue. 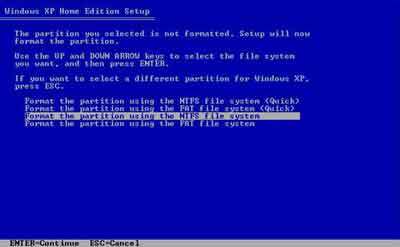 The newly created partition is now formatting with the NTFS file system. This takes a while to complete. Be patient until it is finished. Do not switch off your computer during this process! The tutorial continues with showing you what happens next in the installation process. On completion of the formatting stage, the process continues with installation files copied from the CD to the hard disk. These files are essential for the next stage of the installation process. The time it takes to do this varies depending on your machines hardware specification. Once the files are copied, the installation process spends some time initialising those files to proceed with the next stage of the process. Press Enter to Restart your computer when prompted. Microsoft includes a 15 second countdown to reboot automatically. This is especially handy if you leave your computer during the preparation stage for some reason. This concludes the first part of this tutorial series. Part 2 walks you through the next steps of the installation process. For additional supportwith installing Windows XP take a quick look at the Lifehacker (Opens New Window) tutorial. Why do you continue using Windows XP? What do you like about it? 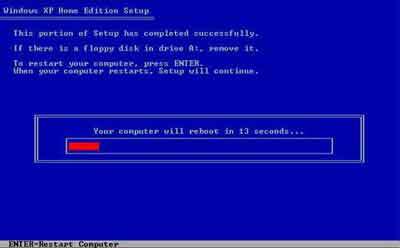 When would you consider upgrading to a later version of Windows? Enter Your Title e.g. "XP is Easier To Use!" Your thoughts and opinions will appear on a Web page exactly the way you enter it here. You can wrap a word in square brackets to make it appear bold. For example [my story] would show as my story on the Web page containing your story.